NEW DELHI—The famously frugal and focused Walmart Inc. is betting $15 billion on a much different kind of company: a sprawling Indian e-commerce startup that has burned through mountains of cash to try to conquer the country’s online shopping market. The deal for a roughly 75% stake in Flipkart Group is set to be announced as early as this week. 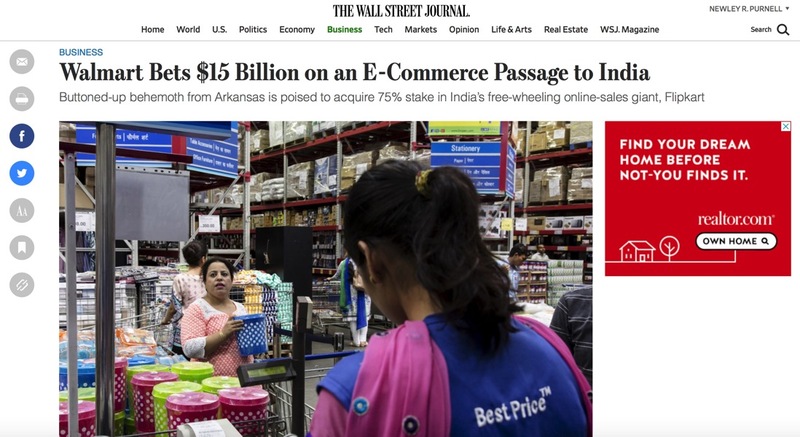 If the union works, it could provide India’s leading online seller needed funds and traditional retailing expertise, while Walmart would be well-positioned for e-commerce in the world’s second-most-populous nation. “I would not have bet on a deal converging between Walmart and Flipkart, primarily because of the culture difference,” said Kashyap Deorah, a veteran internet entrepreneur and author of “The Golden Tap,” a 2015 book detailing the history of Indian tech startups. “Walmart is an extensively positive margin driven culture, and Flipkart has consistently been a gross margin negative business,” he said. The deal shows “Walmart considers India as a long-term strategic market,” he said.